I have a good friend who found out just before Christmas that she is allergic to all dairy products, corn, yeast, and eggs among several other yummy things like chocolate!! She came for a visit and I wanted to fix her food that tasted good and that wouldn’t kill her off so I came up with this recipe which she just loved. It contains no yeast, eggs, corn or dairy products. They are so good I will fix these again and my grandkids will love them. If you don’t have food allergies you can fix these with regular milk and baking powder or make savory breadsticks by dipping them in butter and then rolling them in cheese and herbs. 1. In a medium bowl, combine flour, sugar, baking powder, and salt. Gradually add soy milk and stir to form a soft dough. It will be sticky. 2. Turn dough onto a floured surface and with floured hands gently knead 3-4 times. 3. Roll into a 20 inch by 5 inch rectangle and spray the surface of the dough with non-stick cooking spray. 4. Mix the cinnamon and sugar in a shallow pan. 5. 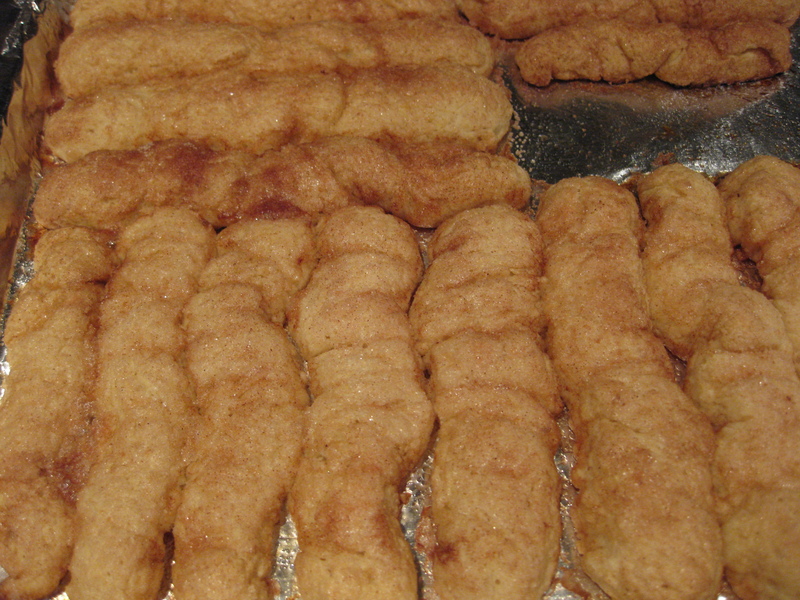 Cut the dough into 24 bread sticks and roll in the cinnamon and sugar mixture. Place on a greased cookie sheet 1/2 inch apart. 6. Bake at 450 degrees for 14-16 minutes or until golden brown. If you wish, roll them again in the cinnamon sugar mixture. Serve warm.